If you love spending time in the garden, then you probably know the importance of wearing protecting clothes. Apart from gloves, gardening knee pads remain one of the must-have protective wears when working in the garden. Just imagine the number of time you find yourself kneeling or fall when working in the garden. Injuries to the knees might not be life-threatening, but the last thing you want is to harm yourself when working. This is why you need the best knee pads that are long-lasting, moisture proof and durable. Here is the list we’ve put up of the best gardening knee pads on the market this year. 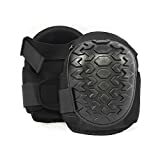 The NoCry Professional knee pads come with a durable EVA foam padding, and a soft gel core that will cushion your legs for the entire period of work. 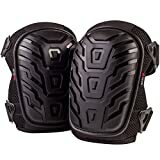 These knee pads are easy to fit with adjustable straps that give a tight and secure fit. A quick release buckle clip saves time when putting them on and off. They are heavily built with a nylon thread and will last you for long. The Golden V is incredibly strong gel knee pads that can be used at home or work. They are a versatile pick for working in the garden, construction site, floor, and roof. With an adjustable clip, these pads instantly snap into place with a second strap that firmly holds them in place. They feel comfortable and strong when worn allowing you to work with ease. With ¾-inch foam padding, the Cate’s Knee pads are comfortable and secure. They are made of the expandable polyethylene EPE which is not only soft but also think ideal for protecting your knees. Neoprene straps offer the pads superior flexibility making them fit tightly and securely. They are super strong with double reinforced stitching and double non-slip straps that keep the knees in place while working. 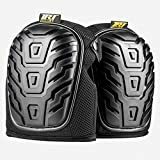 These knee pads are a great brand that has been on the market for over 50 years and a great choice for you. The Metric USA are designed and contoured to the shape of the knee for a perfect and tight fit. These are soft knee pads that will make you feel not only safe but comfortable as you work. There are two extra-long straps to prevent the knee from sleeping outside. They are soft and easy to clean by a simple hand wash when dirty. 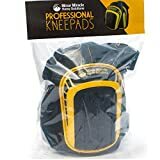 Minor Miracle Home Solutions are known for their high-quality products that help solve simple tasks at home, and this knee pad doesn’t disappoint. They are extremely comfortable with a soft gel core and EVA foam padding. 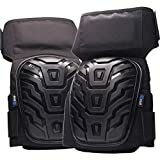 The advanced ergonomic design, adjustable clip and flexible neoprene straps, you have a quality knee pad worth checking out. Fiskars is one of the best-selling gardening knee pads right now and will be an excellent choice for you. With a contoured, comfortable design and thick foam, users will enjoy a comfortable fit when working. The pads are covered by nylon to offer protection against hard places. Dual extra wide straps further ensure the pads fit comfortably and fit the knees tightly. With a 600D polyester mesh, the Kutir is one of the strongest knee pads out there when looking for maximum knee protection. They are highly rated and will be worth checking with a plethora of features well-suited for heavy duty work. The heavy-duty caps are highly design for stability and versatility in all working surfaces. Memory foams make them comfortable for use at home or work. The Cove Professional knee pads are ideal for both work and home use. They are made of a breathable neoprene liner that helps absorb the sweat from your knees and leave you feeling comfortable. The outer non-marking cover is sturdy and works on a variety of surfaces. These pads are oversized and rugged for a comfortable fit and durability. With a new adjustable thigh strap, the RNF Professional knee pads are the ideal pick when you need flexibility in movement as you work. The pads give a secure fit and are loved by carpenters, mechanics, builders, and electricians. They are easy to use and come with a neoprene Velcro padded straps for a comfortable fit. The layered gel makes you feel like you’re kneeling on soft puffy clouds. Protect your knees at all times when working in your garden by getting any of these amazing garden knee pads today. Our selection gives you the best picks so that you can choose with confidence knowing you have a product that will serve you well and offer you good value for money.